This stunning and multi-award winning Champagne needs no introduction. It consistently tops the charts in most blind tastings and most recently picked up the gongs for Best Champagne in the Quality Drink Awards, and was also one of the most highly recommended wines in the latest Decanter own brand Champagne panel tasting. It’s everything you could want from a top quality non-vintage Champagne, with its fine mousse, wafting scents of baked apple and brioche, smooth, creamy, with ripe flavours, yet a refreshing citrus edge – beautifully elegant. It’s simply a top drop. The Tesco buying team have always spearheaded the move to discover unusual wine regions and grape varieties and this is their latest. Although it’s planted all over Italy, it’s still a little-known name in the UK. Bright and fresh, with a ripe, creamy edge, it has a delicious freshness, yet a warm, creamy edge. Full of scents of aromatic lemon peel, and aromas of peaches, and ripe pears. A great all – rounder, with a gentle, easy-drinking style, it’s a great match with seafood pasta, prawn risotto, or baked salmon. A combination of the wonderfully versatile and stylish Riesling grape, and one of the most awarded wineries in New Zealand, Yealands, can’t fail to produce a spectacular result. This delicious wine exudes gentle, elderflower and fresh lime zest aromas, and has a mouthwateringly refreshing style. Bright and perky, it’s brimming with brisk lemon and crisp apple and ripe pear fruit, with a gentle hint of honey and star anise. Blossom–scented, aromatic yet lip-smackingly zesty, enjoy it with gently spiced, or mildly smoked dishes, such as smoked salmon, sushi, and Thai-spiced prawn or chicken curries. There’s a real wine revival going on in Eastern Europe, with some new stars emerging. Slovenia is fast becoming recognized for producing superb, crisp, white wines, and this is one of them – if you like bright, zesty, Sauvignon, but want a lighter style than the more pungent New Zealand styles, this one’s for you. Perky and bright as a button, it’s brimming with crunchy green apple and fresh lemon fruit, with a squeeze of lively grapefruit freshness. Refreshing and zesty, at a delightfully light 11.5%, it’s a perfect or aperitif wine, and just the wine for refreshing seasonal salads, and herb-dusted pan-fried fish. A new addition to the Tesco range, this ticks all the boxes for a big, bold, hearty red, yet with a refreshingly low 12.5% alcohol, which is far lower than many of the hefty levels on many New World reds. Fitou always delivers great value for money, and this is no exception. Made from a typically southern French blend of Carignan, Mourvedre, Grenache and a dollop of Syrah, it’s produced close to the Pyrenees and the Spanish border, and oozes dusky, rich, yet easy-sipping dark cherry and blackberry fruit, overlaid with a twist of cracked black pepper. Spot on with classic beef stews, braised lamb shanks, or cassoulet. It’s worth pushing the boat out, and spending over £10 for this textured, multi-faceted red from northern Italy. Dense, and black-cherry scented, it’s Valpolicella with a major difference, as the wine has been macerated on the skins of grapes used to make Amarone – so it’s ripe, it’s full, and it has a wonderful, savoury, wild herb character, with depth and punch. Full of a luxurious medley of black cherry, squished plum, tobacco and mocha scents and flavours, it’s a gorgeous, full-flavoured, yet silky-soft wine, with an almost gamey edge. Savour with rich stews, wild mushroom risotto, pheasant and venison. Also spot on with a platter of cured hams and prosciutto, with a chunk of top quality parmigiano. This is a simple, yet deliciously soft red, which is an absolute bargain, and a perfect weekday treat. It’s made from the Spanish Tempranillo grape, but grown in Argentina, which is best known for its big, bold, spicy Malbecs. This is different and has real charm. Soft, and gentle, with masses of juicy, raspberry and strawberry fruit, it has a freshness and a warm, fruity style. The perfect everyday red, which would be the perfect match to meatballs, sausages, or lasagne. Best known for Malbec, Argentina has a new wine star, in the form of the softer, and very elegant Cabernet Franc grape. I discovered this earlier this year, when I tasted through 123 of these at a judging for Decanter magazine, and this little beauty proves the point again. Dark in colour, yet fresh and joyful in character, it’s produced high up in the Uco Valley, close to Mendoza at over 1000m above sea leel, and it’s this elevation which gives the wine structure yet balance. Wafting violet, and damson scents, it brims over with crunchy, juicy redcurrant, wild herb and clove spice fruit - perfumed, polished and with a velvety softness, it’s a winner with game, roast leg of lamb, or peppered steak. One of my favourites. This elegant, silky Pinot Noir from about as far south as you can plant vines in New Zealand’s South Island, is as subtly seductive as you can get. It’s restrained, but it’s irresistible. Central Otago, close to New Zealand’s ski resorts in the Deep South is turning out some of the best Pinot Noirs in the world. If you’re not a fan of big, beefy reds, but enjoy a perfumed, soft, gentle red, pick on this one. It’s full of sweet, raspberry and fresh herb-laden fruit, with a restrained, reined- in elegance, and a captivating, entrancing charm. It will add shine and star quality to roast duck, rich Moroccan tagines, and mildly spiced curries. If you enjoy lighter styles of red, try this one. I make no apology for putting two Argentinian reds on my list of top 10 favourites – I fell in love with Argentina and with Argentinian wines, when I went on my first buying trip there, during my time as a supermarket wine buyer. Things haven’t changed, it’s still one of my favourite countries in the world for wine. 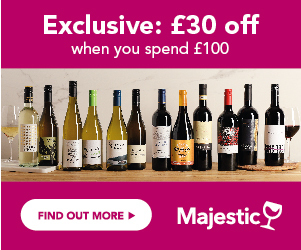 Oozing aristocratic pedigree, and Latino charm, Tesco’s take on Malbec is a winner, and seduces from the start. An award-winning wine, from one of the country’s leading producers, Catena Zapata, it’s everything you could possibly want from Malbec – rich, glorious, oozing voluptuous aromas and flavours of bruised blackberry fruit, dark chocolate and black pepper. It’s bold, beautiful and concentrated, and about as good as you can get with rib eye steak, roast beef, and rich meaty stews. *This article is showing the prices and stock available on 01/12/2014.